A 63 yo male severe lumbar pain lower limb weakness and tingling numbness worsens on walking. Sitting relieves symptoms. On neurological exam depressed ankle reflexes. 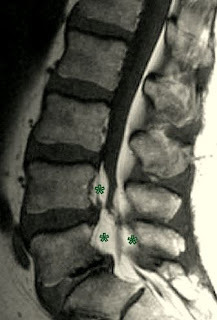 Degenerative disc bulges at L4-5 and L5-S1. Marked epidural fat contributing to canal stenosis with severe thecal sac compression. An abnormal accumulation of fat in the spinal epidural space. Commonly seen at lumbo sacral junction. Often encountered in Obese, patients on oral steroids, endocrinal disorder like ectopic ACTH secretion, or as a delayed consequence of Epidural steroid injections. Signs and symptoms overlap with degenerative spinal stenosis and often both coexist. Treatment options include reduction or cessation of the causative factor, such as cessation of steroid therapy, bilateral adrenalectomy, or weight reduction may relive symptoms. May need laminectomy to relive canal stenosis.